Visitors to the Masjid in 2016 has shared with us their thoughts after the visit. Some of their comments and their photos can be seen below. ・After listening to today’s talk, I felt extremely ashamed for even steeling myself against Muslims, thinking “Because they’re people of Islam…”. I now want to remove the prejudice and misunderstandings of Islam as much as possible. ・It think the people with prejudice towards Islam would also be able to say, “I’m enjoying my life!”, if they live an Islamic way of life. ・To be honest, I used to have a huge prejudice towards Islam, thinking Islam was scary and weird. However, my thoughts of Islam changed after the talk today. I am happy I was able to listen to this from an actual Muslim. Thank you for this valuable experience. ・My previous image towards Islam was that it forces women to do the household chores in their daily lives, that it is engaging in wars repeatedly with other countries, and is just causing so much trouble. This is partly due to the influence of the TV and the media, but I do remember that I associated a strong image of fear with it. I understand now that those that are engaging in wars are only a tiny minority, and that all the other followers of Islam are leading a very normal life. ・I was so astonished to know that IS is not even 10% of the entire population. I felt frustrated, that just because of the extreme actions of this small number, over 90% of the good law-abiding Muslims are all labeled as “people that cause terrorism”. This labeling is not only seen in this matter related to IS. When the same university student or a person with the same hobby, even if it is one person, causes a problem, every person in that group is labeled in the same way. Unfortunately, this is the world we live in. I have been making efforts myself to never become an adult that labels others by only looking at a few, and this feeling of mine grew even more after today’s study meeting.  ・We visited today for our class at school called “Presentation”. I did my own research before coming, but once I directly talked to a Muslim face to face, there was more to learn about the situation of Islam and the way Muslims think. What shocked me the most, was that the information and feelings I have been getting from the mass media contained so much misunderstandings inside. From how misunderstandings produce more misunderstandings, and how painful it is for the people that are harmed by it, I wish to deliver the correct information to many other people, using what I learnt today through presentations. ・In our class at school, it was decided to make presentations about Islam, and thus we visited today to listen to the talk directly from actual Muslims. I felt through my eyes and ears how everyone respects and values peace. I will try my best so that my other classmates can learn the true Islam too. ・I’m glad I could know how Muslims are actually like by visiting the Mosque! ・I am glad I could listen to all this talk and get the correct knowledge about Islam. Also, it was a beneficial experience for me as I was able to deliver this message to a person from my university as well. Thank you! ・At first, I had a frightening image towards Islam, but it touched my heart to know the spirit of respecting and valuing women, and also how it values the spirit of protecting the weak people of the society. Knowing that there are many different types of people around the world, I just wished discrimination and prejudice disappears. ・I realized IS and Islam should not be considered as the same thing. 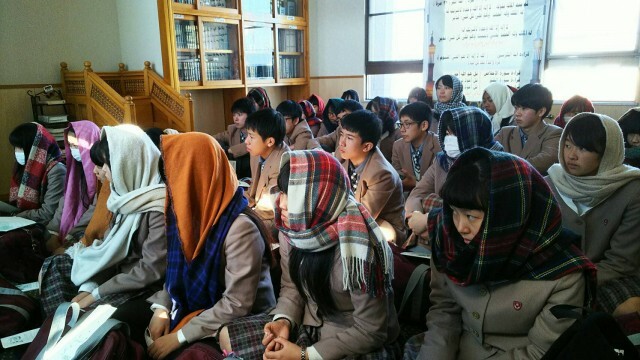 At school, I think teachers should try to sufficiently support the Muslim children. ・My thoughts on Islam was wrong, but after listening to the talk from a Muslim, I now hope to have the correct understanding and utilize it for my practical training period as well as throughout my entire life. ・It was the first time for me to watch Muslims praying, and get to listen to a talk from an actual Muslim as well. We were treated politely and kindly, and was able to spend a really fun time. The speakers happily answered the various questions I asked. I learnt through the voices of an actual Muslim, what I could not have learnt through books. Today’s experience allowed me to deepen my understanding of Islam, and also made me want to learn more. Thank you so much!! ・I learnt the difference between the Japanese sense of values and the Muslim sense of values. Though it was a short time, now that I know many new things and some of my doubts and questions towards religions were cleared off, I somehow felt relieved and refreshed. ・My perception towards Islam changed so much when I heard that Islam is not a “religion” but one way of life. I used to think Islam was a religion with so many difficult rules to be followed, but I was told today that Haraam has reasons to it, and this made me understand. I understood about the food restrictions too. She also spoke about IS on how they are a small minority, that the majority of Muslims find them troubling, that Islam prohibits the killing of a person for no reason, and that Muslims love peace. It was beneficial, as I did not know much about Islam before. ・We sometimes think of Islam as a dangerous religion, because we normally have no chance of interacting with it in Japan, but today I learnt that it is actually a peaceful religion. Learning about the situation of the world today was also extremely beneficial. I felt the importance of deepening our understanding of religion, and that it would be an ideal world if we could respect different religions and cultures, and live together in peace. I listened to a kind speech about receiving Muslims in Japan. My way of thinking (regarding that receiving) had some hinging on what is called Halal certification, but today’s speech kindly made me notice that I mistook approaching (matter of) hospitality towards Muslims. I also believe that it would be good if thoughts of people concerned in Muslims’ receiving, including Madam Sara who kindly gave me the speech, spread, and then we can wipe out, even a little, the negative image of “strictness” and “difficulty” which Japanese people easily tend to embrace about Muslims’ receiving. Thank you very much for your kind careful correspondence with me today. ・I thought I knew about Islam already to some extent, but after listening to today’s talk, it made me realize my lack of knowledge. As my interest in Islam deepened even more, I wish to visit the Masjid again, and also continue with my research in Yokohama. I appreciate this extremely valuable experience you have given me. ・I greatly appreciate this opportunity that allowed the students to know various cultures does exist in places that are very close to us. In a time where terrorist incidents are occurring like every year in France, the students head to the Mosque expressing their complicated and mixed feelings, but every single time, they return with shining bright faces. ・When I told my parents that I am going to the Mosque today, my parents were worried. But the Mosque was actually a beautiful and calm place. I understood that Muslims are people that love peace from Ms. Sarah’s talk too. ・It made me want to go listen to the talk again. I don’t think of Islam as a dangerous religion any more. 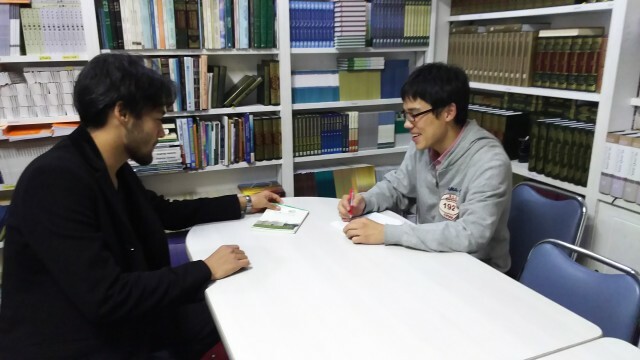 ・I am glad I was able to receive an explanation on Islam in a Mosque in Japan, before going to France for a study abroad. I don’t think I will look at the Muslims in France with prejudice anymore. ・Thank you for the talk about Islam. It was made very easy to understand. Meeting, exchanging opinions and getting to know Muslims of our age was especially fun. I was extremely nervous at first, but that gradually faded. I want to say thank you to everyone. 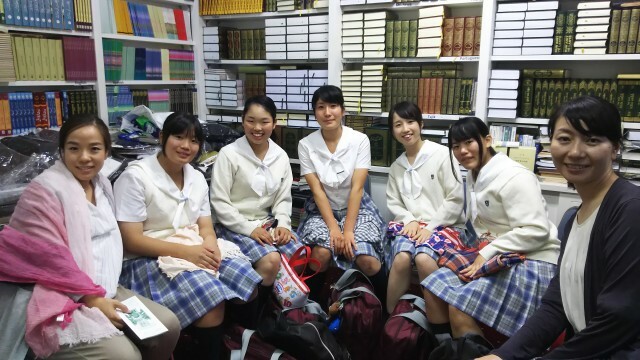 ・I have only studied a little about Islam before; when I was in junior high school. I felt that Muslims are in fact not unique, but are actually absolutely normal people just like us. However, because of actions from a tiny minority like the IS, our understandings get connected with the misunderstandings. The biased coverage by the media is also responsible for this. After vising the Mosque, I felt the importance of having the ability to understand things correctly. ・Assalam Alaikum! Thank you for the talk about Islam, tour of the Mosque, the food, and warmly welcoming us despite your busy schedule. Muslims were all kind people, and I felt that they are actually not so different from us! ・I was surprised at many things in today’s visit. But what surprised me the most was that there were so many Muslims that were so bright and friendly. From the prayer and what I saw in commercials, I thought they would be quiet people, but it was astonishing that they were in fact bright and cheerful people. ・Before I knew anything about Islam, I used to also have a negative image of Islam because of the troubles IS is causing. However, just like I was taught in my ethics class at school, as well as at the Mosque today, I strongly felt that it is wrong to just disregard and keep a distance with the Muslims. The people that were at the Mosque happily welcomed us, and I really felt their kindness. To ignorantly decide that Islam is a fanatical religion, just because we do not know anything, is just extremely saddening. ・I had never seen the prayer before, and I was surprised to see even the children praying properly with the adults. The meal the Mosque gave us was very delicious. At first, I was worried if I can eat it because I have a lot of food I don’t like, but I was happy that it was easy to eat for me and that I could eat a lot of it. The curry was especially easy to eat, and really tasty. ・Thank you for warmly welcoming us today in Ramadan. I also tried fasting, and this made me impressed with the spirit of the people that have been following this Islamic teaching for years and years. They were not just blindly following the teaching, but were rather deeply understanding the meaning behind it while taking it into practice. Looking at them gave me an opportunity to think about the meaning of “belief”. 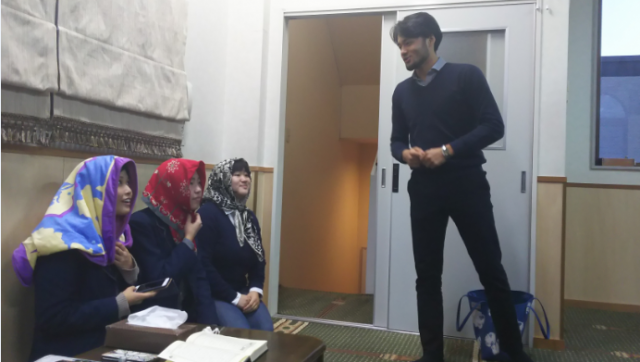 Through the warm welcome I received, I felt Islam more close to me in just one day. I will definitely come again. Thank you so much for today. 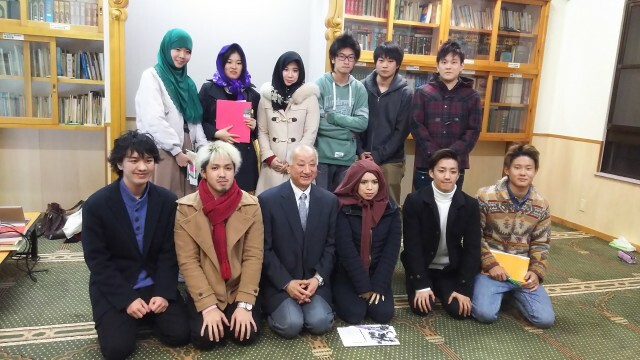 ・I visited Nagoya Mosque today accompanying the students for their research. 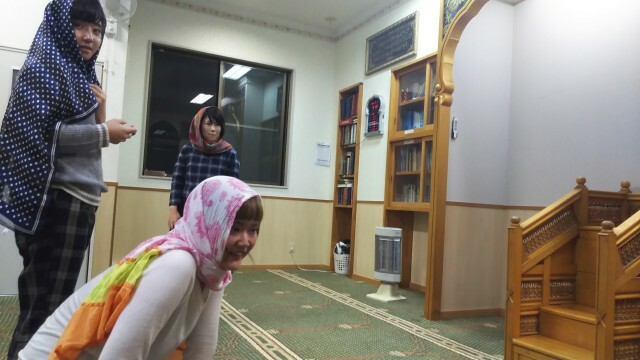 We have visited the Mosques in Osaka and Kobe as well but we could not really understand about the Islam in Japan. However, the talk today was extremely easy to understand and it explained from the basics. It was very beneficial that the speaker even gave advices on the students research themes. 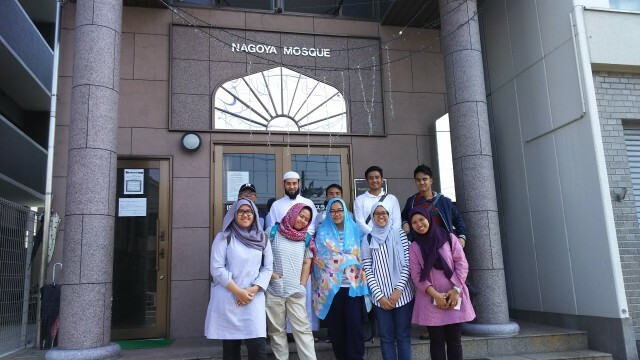 From all that I experienced today, I feel Nagoya Mosque has a unique characteristic that does not exist in other cities of Japan (kind to Japanese Muslim/Muslimah, has a big heart to accept visitors from any countries). I look forward to visiting again along with the students. ・Being able to listen to the explanation from the basics to the very specific details was an extremely beneficial experience for me. As I have been to Indonesia before, I thought I already knew a bit about Islam and Muslims. However, listening to the talk, I realized that there were Muslims in Japan that are facing the realities I knew nothing about. If I had not visited the Mosque today, I would have continued to live my life not realizing the existence of the minorities in Japan. Even from this aspect, I feel so glad I could listen to the talk today. I wish to participate in the women’s gathering and study groups in the future too. ・Thank you for giving us your precious time. After listening to Ms. Sarah’s talk and actually watching the prayer, many participants said that, contrary to the image they had, Islam was actually not strict and full of rules and regulations, and that their images changed. It was very interesting to know that after bearing the hard time of fasting, there is a heart-warming time right after. […]. Thank you for all the preparation from the time of the interview to the day of the event. We will visit once again when we have the chance. ・I thought the biggest difficulty Muslims face in Japan was about food. However, this was wrong, and I was told their biggest difficulty was actually the prejudice. After listening to the talk today, I think my understanding of Islam has deepened, so I wish to do what I can to make the prejudices disappear as much as possible. ・I visited the Mosque today for the first time, because I am writing my graduation thesis on a topic related to Islam. I thought I knew about Islam through what I have read online and in books. However, I felt extremely ashamed of myself when I heard the voices directly from Muslims and realized I had so much misunderstandings. As Ms. Sarah said that “if there are 1.6 billion Muslims, there are going to be 1.6 billion different mindsets”, I felt it is important to not just believe everything the media says, and to rather approach it with a flexible mind. ・After listening to today’s talk, I realized how much we were relying on the opinions given to us by the media. It was also surprising that even though we might understand something with our minds, impressions can change drastically when we actually listen to the talk.  The most remarkable thing I felt today when I came to this mosque is the extreme kindness (of the people there) and the homely comfortableness. I had a little feelings of fearing or some prejudice before I came, but now I feel shameful that I looked at Muslims with such a discriminating eye. Now I understand that extremists are only a small part of 1.6 billion Muslims, and not all Muslims are like that, but rather most of Muslims are usual kind people. The bad things done by people are more highlighted than the good things done by them, and I felt it was queer to lump both things together.  I used to feel a little afraid when I just hear “Islam state”, but (now) I believe there is nothing dreadful about Islam at all. I used to think that I would never like to do fasting or such alike, but I did not know that fasting is such an enjoyable thing. Moreover, I was astonished to hear that it (Ramadan) is the most weight-gaining month. Since my impression of Islam has dramatically changed, I would like to try to talk (about it) to other friends.  I had no relation with religion before at all, and although there were some Buddhist and Christian friends round me but no Muslim was, so what I thought today after I heard various things in the speech is that (Muslims) are unexpectedly usual.  I used to have the image that Islam is frightful before I learn (at mosque), however my thoughts have changed and I believe (now) that the extremists are only a small proportion while most Muslims are kind good people. And since I believe that facing prejudice is very disgusting and bitter, I wish that prejudice of more even one person against Muslims would vanish. 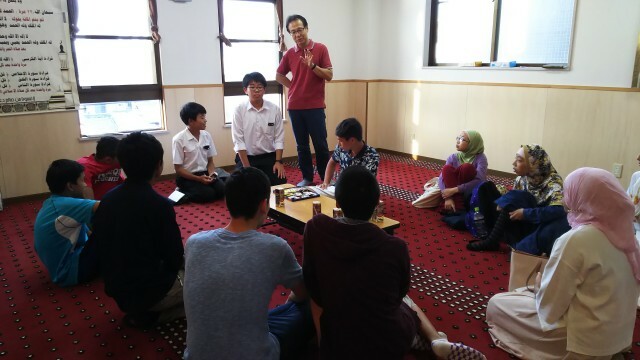 As I am a Japanese language teacher who met so far many young Muslims, I thought I knew Islam in general, but (in today’s visit) I learnt many things and there were many things which I didn’t know or I misunderstood. (Omission)/ Although it doesn’t seem to be may fate to become a Muslim at the moment, I believe that it is a very good thing to be able to acquire many good customs and points of view through Islam teachings such as Ramadan, daily prayers, appreciating the females, quitting idolatry. Because it is the human who forgets soon and flows with the bad stream…(Omission)/ I believe the human history contained various tragedies resulted from ignorance and misunderstanding, however, the influence of media that reports accidents, troubles, terror actions and violence is great in a country like this, most people of which (Japanese) do not have a any chance to contact directly with usual kind Muslims. Now that I have heard the speech this time, I really wish that Japanese media quits using [Islam state], its Katakana (ISURAMIKKU SUTEITO) or its abbreviation (IS) easily. I have learnt a lot of things about Islam and Muslims by hearing (today’s) speech which can not be heard from outside (Islam). / My heart was very touched when they kindly taught a stranger like me how to tie a scarf (Hijab) just upon hearing a few words from me about my interest in it. I will be glad to have an opportunity to talk with everybody at leisure. I feel honored to be able to hear (today’s) speech which I have an extremely deep interest in its (contents) such as the difference between Kur’an and Hadith, or the original meaning of Shee’a and Sunnah. Although I came here supposing I had studied about Islam, I realized that I had mistakes in several points because of my misunderstanding or prejudice. I am heartily grateful that you granted me the opportunity to restudy the basics of Islam. 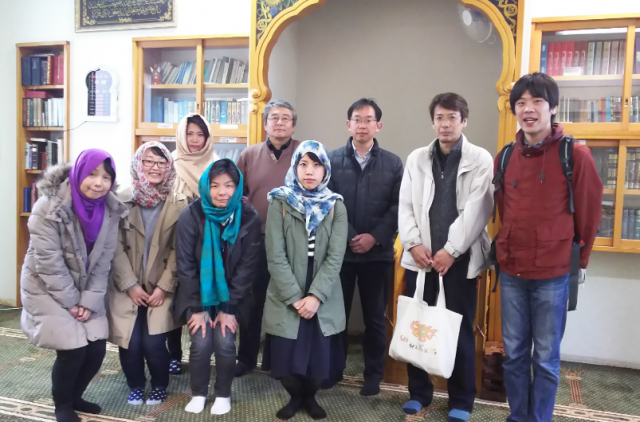 We were able to know that there are several misunderstandings about Islam and that we – Japanese- are told considerable wrong information through mass media. In this context, the most impressive thing to me was the word of Jihaad. Just before today’s visit, I used to think that Jihaad was to fight in a holy war. However, it was revelatory to know that the meaning of Jihaad was to exert efforts. Thank God I came to the visit today. It was a precious speech (today) that made me reconsider my own understanding and made me wonder; didn’t I myself know anything, or didn’t I keep thinking of the mosque based on a certain premade image!. 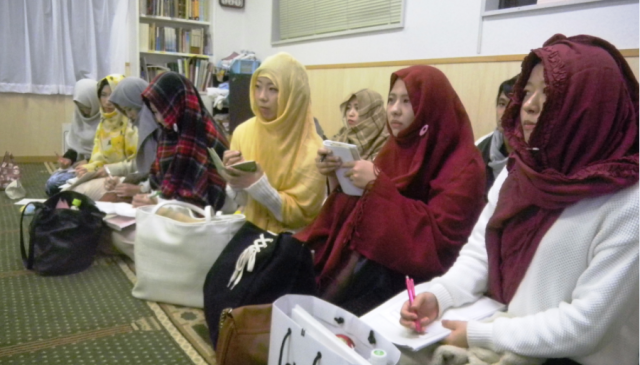 While I feel shy because I have not headed to visit Masjid Nagoya in spite of that I have lived for 15 years in Nagoya studying about making a multicultural country, I am thinking to continue studying in the same way of today (the visit). You gave us a precious speech that you kindly conveyed in an easy-to-understand way. It is relaxed to have prejudice and to discriminate, just like one’s surrounding people, without knowing (the truth). I am going to learn myself then I will start talking about establishing a society in which children can live smoothly. I realized the significance of knowing. After I had visited the mosque in the city I live in and had actually heard the speech of a Muslim I felt that Islam was not an odd thing, rather it was a familiar thing. Being a familiar thing is an important standpoint for deepening the right understanding of Islam. It was a very precious time (at mosque) in which I directly met (you) and I could listen to a powerful, broad-minded and heartfelt speech. I believe we should first know about the existence and feelings of people from various beliefs and points of view.